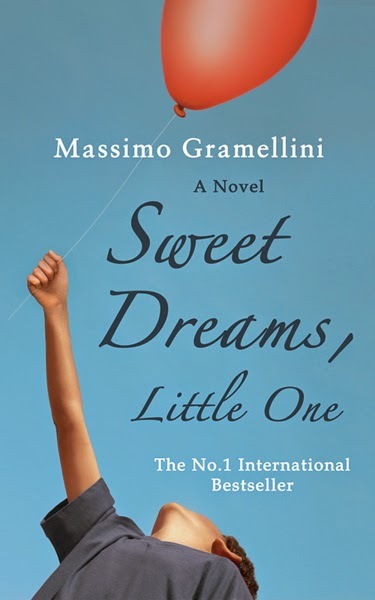 Sweet Dreams Little One written by Massimo Gramellini was actually first published in Italian and later translated into fourteen languages. It has now sold over 1.2 million copies in Italy alone, it is now an international best seller. The book follows the story of a little boy who at 9 years old loses his mother to what he thinks is cancer. We are given the chance to join this boy on his journey from a young child into adulthood and beyond. "After forty years, it's time someone told you the truth"
The news of his mother's death is broken to him by Baloo, the priest who runs the local cubs, this goes to show just how young this little boy is. "You know your mummy is your guardian angel, don't you? For a long time she's wanted to fly up there so she can look after you better - and yesterday the Lord called her to join him.."
My heart broke for this young boy. It is clear from the start that this little boy struggled with his grief. Feelings of abandonment and rejection that he didn't really know what to do with. What I like, is seeing things through the innocence of a child's mind and somehow Massimo managed to put a bit of humour and lightheartedness into a somewhat sad tale. I could imagine my own children thinking and saying similar things. "The last few months had been full of tests she'd had to take. Tests in hospital that is : if she'd come to school with me, I could have shown her how to copy the answers"
"I grew up thinking the State was a manufacturer of biros"
Massimo gets you the reader to make you feel a lot of sympathy for this character, even when his grief manifests as anger and blame towards others. As he grows older his grief is turned into the demon 'Belfagor'. This demon becomes the reason for many of his outbursts, it allowed him to place the blame elsewhere. Belfagor allowed him to escape, stopped the world hurting him. However this demon made him very self absorbed. He thinks that somehow he is owed something, he can't see that others are grieving too or that his actions aren't just hurting himself but others too. As he goes through life, he enters in and out of various relationships and jobs and all the while he still has many unanswered questions. "Why did my mother have to die so young? Would I have been a different person, a better person, if I'd grown up as part of a loving family?" It's not until he is working in Sarajevo and he he is fighting for a boys safety who sadly later loses his life, that he really begins to see the error of his ways as such, starts to want to actually live instead of just existing. About half way through the story, I began to have my surspicions as to what had really happened to the boys mum all those years ago, although I really hoped that I was wrong. "I still feel I'm to blame for your mother. If I hadn't gone back to bed and fallen asleep that night.."
It wasn't til I reached the end of the story that I realised this book was actually based on a true story, Massimo's life, this made it all the more poignant. The author was very brave to be so honest about his emotions as he risked others thinking him selfish. I admit to shedding a few tears when I reached the end, a truly moving story, one which I think could help others who are struggling with their own grief. I recommend this book to anyone, even if you are short on time, this book is easy to read as each chapter is short, it makes it easier to pick up and put down as when you feel you can. Available from Alma books themselves or amazon if you prefer reading on your kindle, definitely one to put on your reading list. Disclaimer : I was sent a copy of this book for free however all thoughts and opinions are my own. wow, It would be hard to read this book I think. Thanks for your awesome review. I am interested in it now.